The Winter 2009 photo came to us courtesy of Tom Kelly, grandson of one of the people depicted. 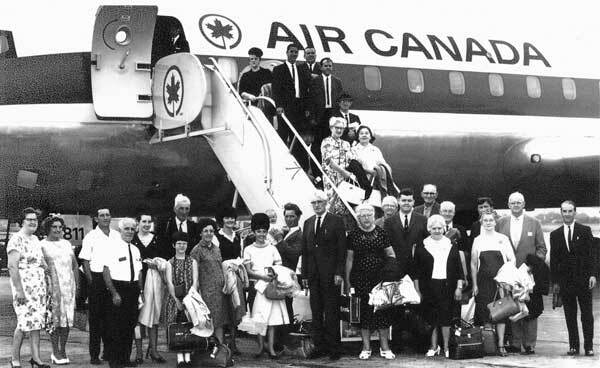 It is a photo of a group of travelers about to board an Air Canada flight for a trip to Ireland sponsored in 1967 by the West Side Irish American Club. The travelers include, on the ground: Beatrice McIntyre, Annie McGinty, Steve Mulloy, Art McCrystal, Rosaleen Keogh, ? O’Neill, ? Murray, Mary Murray, Mary Chambers Lavelle, Margaret O’Malley, (infant) Kathleen Lavelle, Gerry Lavelle, Pat Lynch, ?Catherine White?, Mary Dever Carney, Tom McIntyre, Eneas McNulty, Beatrice Colbert, George Colbert, Tommy Kilbane?.?.?, ? Tigue?. On the stairs of the plane, bottom to top: Margaret Corrigan Kelly, Marie Gallagher Cusick, ? Credington?, Pat O’Donnell, Billy Ebbinger, Pat Davitt, Maggie Davitt. Thanks to Bridgie Conway, Anne Mulloy, and Helen Malloy for help in identifying the travelers.